Almost a year ago, we moved back to Texas. Our top priority was to find housing. We were very fortunate and quickly found a place that suited our needs. Not only was the interior exactly what we wanted, the giant oak tree in the front yard captured our hearts. It was love at first sight. 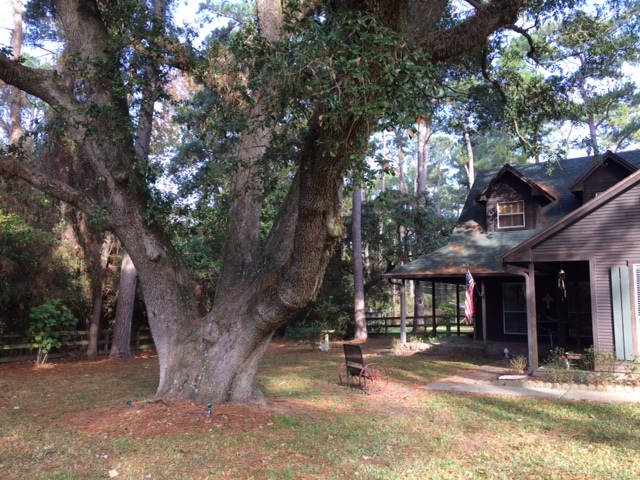 After we moved in, we noticed dried brown leaves curled on the branches of the big, beautiful tree and feared the giant oak estimated to be 200 years old was dying. Raising my eyebrows, I tilted my head and smiled. I’d never heard of such. Sure enough, the first rain those ugly brown knobs of dead leaves unfurled to life. The name resurrection fern comes from the plant’s ability to live for 100 years without water. Common names include little gray polypoid, scaly polyploidy, and miracle fern. The resurrection fern is an epiphyte — an organism that lives on another living organism without negative impact on the host. Air and rain nourish an epiphyte. Even though it can lose up to 75 percent of the water in its cells during droughts, the fern can exist with only air. Rain revives the plant as it absorbs the water into its cells and it becomes a healthy green fern again. The fascinating fern carpets the branches of large cypress and oak trees like ours. It can also be found growing on the surfaces of rocks and dead logs as well. Frequently Spanish moss, another epiphytic plant, is found nearby. Here’s a YouTube video of a fern resurrecting. You can see the brown leaves stretch outward and turn green. I’ve never actually seen the process happening, but I can attest that it does.